Email for details about visiting or other questions. Our chapter house is open to the public as a museum Saturdays 1:00-4:00 PM starting in late June through late August (closed the week of the Dutchess County Fair), during scheduled events, and by appointment. Judge Henry Beekman, Rhinebeck’s patentee, offered this cottage to his granddaughter, Janet Livingston and her husband Richard Montgomery at their marriage in 1773 to live in while their Rhinebeck estate, Grasmere, was being built. The house was located on the Old Post Road, now known as Montgomery Street. In the spring of 1775, Richard Montgomery was offered the commission of Major-General in the Continental Army. He and General Philip Schuyler were placed in command of the Northern Forces with the objective of rousting the British army out of Canada. Montgomery lost his life during a failed attempt to capture the walled city of Quebec, Canada, December 31, 1775. Janet completed their Grasmere estate and lived there until 1802, when she built a new home with bountiful orchards and farmlands, “Chateau de Montgomery” (now known as Montgomery Place) in Annandale on Hudson. 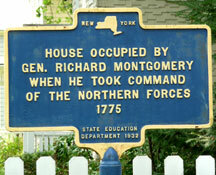 In 1867, the Montgomery house was moved to its present location at 77 Livingston St. in Rhinebeck, New York. It was purchased in 1928 by Mrs. Helen Reed de Laporte, founder of the Chancellor Livingston Chapter, NSDAR. In 1930, she deeded this historic house to the chapter. In addition to managing the property, the Chancellor Livingston Chapter, NSDAR, holds a collection of local artifacts, pictures, and genealogical documents at the house.